Endolymphatic hydrops is a disorder of the inner ear and can affect the endolymphatic fluid of the cochlea, the vestibular apparatus, or both. Although its underlying cause and natural history are unknown, it is believed to result from abnormalities in the quantity, composition, and/or pressure of the endolymph (the fluid within the endolymphatic sac, a compartment of the inner ear). In a normal inner ear, the endolymph is main­tained at a constant volume and with specific concentrations of sodium, potassium, chloride, and other electrolytes. This fluid bathes the sensory cells of the inner ear and allows them to function normally. In an inner ear affected by hydrops, these fluid-system controls are believed to be lost or damaged. This may cause the volume and concentration of the endolymph to fluctuate in response to changes in the body’s circulatory fluids and electrolytes. Endolymphatic hydrops may be either primary or secondary. Primary idiopathic endolymphatic hydrops (known as Ménière’s disease) occurs for no known reason. Secondary endolymphatic hydrops appears to occur in response to an event or underlying condition. For example, it can follow head trauma or ear surgery, and it can occur with other inner ear disorders, allergies, or systemic disorders (such as diabetes or autoimmune disorders). Symptoms typical of hydrops include pressure or fullness in the ears (aural fullness), tinnitus (ringing or other noise in the ears), hearing loss, dizziness, and imbalance. Diagnosis is often clinical—based on the physician’s observa­tions and on the patient’s history, symptoms, and symptom pattern. The clinical diagnosis may be strengthened by the results of certain tests. For example, certain abnormalities in electrocochleography (which tests the response of the eighth cranial nerve to clicks or tones presented to the ear) or audiometry (which tests hearing function) may support a hydrops diagnosis. New research has shown that MRI with contrast in the inner ear can give a definitive diagnosis of endolymphatic hydrops, but likely would not be able to differentiate between primary (Meniere’s) and secondary. This is most commonly not used because clinical diagnosis is often accurate. Ménière’s disease (primary idiopathic endolym­phatic hydrops) is discussed in detail in a separate publication of the Vestibular Disorders Associa­tion (see the list at the end of this document). In brief, Ménière’s disease is characterized by sudden, violent attacks or episodes of vertigo, tinnitus, hearing loss, and aural fullness. The attacks typically occur at intervals of weeks to months, with symptom-free periods between attacks. Over several years, there is partial destruction of hearing and sometimes of balance function. Ménière’s disease affects both ears in up to half of those who experience it. Treatment is intended to improve symptoms, manage acute attacks, deal with the damage to hearing and balance, and maintain quality of life. The treatment of secondary endolymphatic hydrops (SEH) is somewhat different. Since SEH is secondary to (that is, results from) an underlying disorder, the symptoms tend to be present more continuously, rather than occur­ring in spontaneous attacks. However, they are often less violent, and SEH may cause less damage to hearing and balance than does Ménière’s disease. Treatment of SEH has five goals: to stabilize the body’s fluid and electrolyte levels; to identify and treat the underlying condition that is driving the SEH; to improve daily symptoms; to manage persistent symptoms and changes; and to maintain quality of life. Stabilizing the fluid and electrolyte levels may help reduce or relieve the symptoms. Modifica­tions in diet may be necessary in order to achieve such stabilization. A hydrops diet regimen (HDR) often makes many people with SEH feel significantly better without any other treatment. The HDR is the cornerstone of stabilizing overall fluid levels. The most important aspect of this regimen is consistency. Eating a balanced diet in moderate amounts at regular intervals—with meals and snacks of a consistent size, eaten at about the same time every day, without skipping meals or alternating tiny snacks with huge meals—helps the body’s fluid and electrolyte levels remain stable. A second key element of the HDR is mini­mizing the use of solutes (salts and sugars) in the diet. Solutes require the body to use large amounts of fluid for dilution and digestion. This causes large fluctuations in body fluids and consequently in the endolymph, which can trigger hydrops symptoms. An important starting point of this diet is to avoid adding salt or sugar to food and to avoid eating prepared foods (those that come out of a can or other container). Adequate fluid intake is another mainstay of the HDR. In order to function at its best, the body needs lots of water—six to eight glasses spaced evenly throughout the day. It is also important to anticipate and replace the additional fluid lost through perspiration during exercise, fever, or hot weather. Other fluids—for example, low-sugar sodas, herbal teas, and low-sugar fruit and vegetable juices—may also make up part of the daily allotment. Caffeine (found in coffee, tea, some herbal teas, colas, chocolate, and some medications) and alcohol have strong diuretic properties and may need to be restricted, because they can cause the body to lose more fluid than it has taken in. Physicians may prescribe diuretics as part of treatment, not to cause fluid loss, but rather to “push” the kidneys to excrete a constant amount of urine throughout the day, thus helping to minimize large swings in the body’s fluid content. With diuretic use, drinking lots of water is im­portant to avoid dehydration. Certain diuretics require the use of a potassium supple­ment to replace potassium lost through the urine. It is important to discuss proper use of medication and intake of food and water with the prescribing physician. This goal is complex and will likely involve both the otologist (ear specialist) and the primary care provider (internist, family practice physician, nurse practitioner, etc.). Once an underlying condition is identified and treated, SEH symptoms tend to improve over time with proper management. Hydrops associated with head trauma or ear surgery usually improves over the course of one to two years following the causative event. With the use of the HDR and possibly also a diuretic, balance symptoms may improve dramat­ically. Other medications may be used to help with persistent dizziness, nausea, or vomiting. Maintaining normal weight, or losing any excess weight. When a person is overweight, the vestibular system must struggle to deal with a larger-than-normal and displaced center of gravity. Avoiding aspirin in high doses, which can cause temporary tinnitus. Avoiding ibuprofen and other NSAIDS (nonsteroidal anti-inflammatory drugs), which can have a direct effect on fluid balance and may increase symptoms in some SEH patients. Stopping smoking. Smoking constricts the single, tiny artery that feeds the ear, thus depriving it of oxygen and nutrients. Maintaining general health by getting adequate exercise and sleep, both can help with cardiovascular health to support the inner ear. Exercise can help the musculature needed for balance stay active. Vestibular rehabilitation, a type of specialized physical therapy for vestibular patients, can improve tolerance for activity, overall energy level, and symptoms of dizziness and imbalance. The cognitive symptoms that often accompany vestibular disorders—for instance, trouble with concentration, short-term memory, reading, or prioritizing tasks—may diminish as the hydrops is brought under control, but occupational and speech therapists can help if any symptoms remain. If dizziness and vertigo become intractable, more aggressive measures may be considered. Medications or surgery can be used to selectively destroy the problematic inner ear structures. There are various surgeries that may be recommended. Endolymphatic decompression procedures aim at relieving fluid pressure in the inner ear. Another type of surgery is a labyrinthectomy, which destroys the membranous structures of the inner ear that detect gravity and motion changes. Semi-circular canal plugging and neu­rectomy (cutting the vestibular nerve between the ear and the brain) create mechanical changes that prevent abnormal inner ear signals from reaching the brain, thus reducing symptoms. These procedures do not cure the underlying disorder and are not without risk, but they may improve symptoms in some cases. SEH does not usually result in significant hearing loss. If it does occur, modern hearing aids and other assistive devices may be useful. In addition, tinnitus-masking devices can be used to help deal with annoying tinnitus. Very often, people with inner ear disorders attempt to avoid aggravating their symptoms by restricting their activity and becoming reclusive. This is counterproductive. 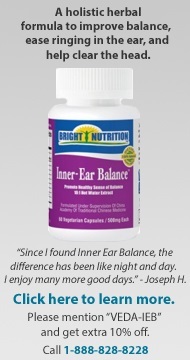 In fact, remaining as active and busy as possible (within safe limits) helps the brain adjust to changes in inner ear function and helps control symptoms. The physician may recommend a course of ves­tibular rehabilitation therapy to help the brain compensate for changes in balance function. As with any chronic disorder, maintaining a healthy outlook and as normal a routine as possible is essential. Creating a safe physical environment in the home is also important, as well as taking into consideration whether one should undertake potentially hazardous activities such as driving a car, climbing ladders, or participating in sports. As an “invisible” disability, an inner ear disorder can be frustrating to manage. A person may feel miserable, yet “look normal” to friends and family. Educating others about the illness can help them better understand the difficulties and consequences of having a vestibular dis­order. Counseling or participating in a support group for people with inner ear disorders may help to deal with the confusion or secondary depression that often accompanies these conditions. In any case, the physician and the physician’s staff remain the patient’s primary resource in understanding and dealing with SEH. Authors: Susan Pesznecker, RN with the Vestibular Disorders Association. Edits by Jeremy Hinton, DPT. Click here to download the "Secondary Endolymphatic Hydrops" publication.